"Amazon Prime is an annual membership program that offers customers unlimited Free Two-Day Shipping on millions of items, instant streaming of thousands of movies and TV shows and access to borrow a Kindle book every month, including New York Times Bestsellers, with no due dates -- all for just $79 a year. 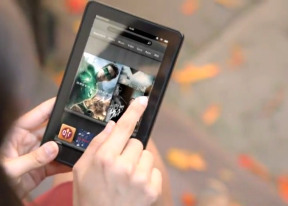 Eligible customers who purchase a Kindle Fire will be given a free month of Amazon Prime. " Well who needs an android based OS and a 1.0 GHz processor when no access to the android market and the cool apps. 4th ipad dosnt have external memory (although it does have alot of internal and other tabs do) but amazon stores all content in their Amzon cloud feature. Contrary to what the article states, Amazon is not losing money on the tablet. It has been reportedly costing Amazon $149 to make. There is nothing wrong with Amazon Kindle! You can have performance chart at besttablets2.tk and consider buying kindle fire or ipad! So. Low powered processor in a cheap tablet gets 2nd highest browser benchmark and the reviewer says this is a disappointment? I have never rwad such a contrived review. i enjoyed this tablet very much. and besides i don't fancy tablet. i only need it to read ebooks, browse the Internet, update my facebook, and listen to music while comfortably seating anywhere...whoa! Raj, 18 Feb 2012The sales of this device proves alone that it wasn't a disappointment. I have yet to meet one ... moreTell me do you see anyone raving and showing off their Kindle Fire ? Or how many free apps they downloaded or the incredible spec's its got no , Even worse the fact that you can't access the android market is a complete let down. In the US its going to sell ,but worldwide its going to be over powered by Galaxy Tabs, Flyers , the Prime etc. Devices that have android access . Smokeyemp , 17 Feb 2012This tablet isn't Android, it simply used Google and threw it to the side after that. Amazon K... moreThe sales of this device proves alone that it wasn't a disappointment. I have yet to meet one person who bought the Kindle Fire that regretted it, that's saying a lot. Cost the same as the heavily discounted 16GB blackberry playbook but is a much better tablet. Smokeyemp , 17 Feb 2012This tablet isn't Android, it simply used Google and threw it to the side after that. Amazon K... moreyou can root it, crack it and install android market. This tablet isn't Android, it simply used Google and threw it to the side after that. Amazon Kindle is a disappointment people will buy it cause of its low pricing ,but when they get home that will all change ,rather go buy yourself an iPad2 or Samsung Galaxy Tab with the thousands of apps. And being able to get most of them for free . This is simply a lock into Amazon by blinding the consumer thinking they are going to get the freedom of Android .